Today, branding no longer belongs solely to larger companies that can devote hefty chunks of their budget to building a brand. One result of the online revolution is that all businesses, large and small, can easily brand themselves. Now more than ever, companies and not-for-profit organizations across all industries have increased reach and can easily develop their brand presence. • What are their demographics (age groups, genders, educational profiles, and locations)? • What do they like to do online? • What social media platforms are they active on? • How would interacting with your brand influence them? Successful brands emerge from a certain challenge, powered by a unique vision and a drive to share something with the world. Share your brand’s story – what motivated you to start your business? When you share your story with your target audience, you invite them to join you in your journey. The values that your brand conveys are a result of your brand’s story. What is the visual expression of your brand’s story and personality? The foundation of your brand is your logo. Your website, business cards, brochure, and packaging all communicate your brand to your customers. Be willing to invest time and money to create an exceptional logo. Hiring a graphic designer will ensure that you get a unique and timeless logo that truly represents your business. The tone of your communications, your website content, and even your tag line all critically influence how people engage with your brand. Take the time to build a brand vocabulary. 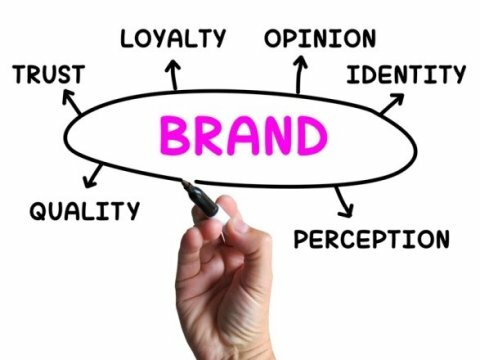 A brand vocabulary is a pool of keywords that help characterize who you are, what you stand for, and what you offer. For example, if you are branding your Holistic Health Coaching business, some brand vocabulary words that you could use would be Health, Nutrition, Strength, Goals, Fitness, Wellness, and others. This vocabulary will be your toolkit for you to use in your blog posts, online ads, tweets, emails to clients, and more. Branding is all about consistency. Don’t confuse your customers with multiple logos or different voices. Market your business the same way in print and online. By keeping your branding consistent, your customers can easily engage with you and find your products or services without difficulty. “A brand is a story always being told,” said former Nike and Starbucks executive Scott Bedbury. Start building your brand and tell your story! Laurie Enos is the co-owner of Blue Lilac Marketing Group, a Rochester-based marketing firm that designs websites, logos and printed materials, handles social media, manages public relations, and stages events for small- to medium-size businesses. She can be reached at BlueLilacMarketing.com.